�The Monkees Watch Their Feet� (a.k.a. 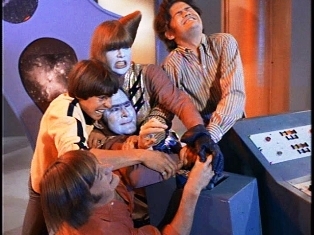 The Monkees foiling an invasion from Planet Zlotnick is shown. In the film, David, Micky and Peter are seen in their pad getting ready to play for a gig, when one of Micky�s tum-tums, the shirt and pants that he was wearing suddenly disappear, and Mick starts to wonder, �Could it be that my clothes are putting me on?! ?� Somewhere on the beach, The Captain and his assistant, aliens from the planet Zlotnik, have landed on their spaceship. They have caused Micky�s things to disappear as they prepare to initiate plan D: disposing of Earthlings through various means of destruction at their command. Later that day, Micky dressed in a robe finds his things on the beach which is a trap set by The Zlotnikans and as he collects his things they zap him in their spaceship. Micky is clueless about his whereabouts, but The Zlotnikans think he�s on to them and when Micky pulls a handle he winds up zapped and caged as the aliens subject him to a duplicating process. When their efforts at first produce a gorilla (not necessarily the same species as a primate! ), they make some adjustments with the machine by reducing the brain tissue and lowering the I.Q. ; this time, they succeed by producing an addled robot copy of Micky, which the aliens send out to spy on the Earthlings and report everything back to them while they question the genuine article. The robot Micky appears on the beach where David and Peter find him and prepare to take him back to their pad not noticing that is feet are backwards. On their way back home, they spot the spaceship but the robot Micky convinces them it isn't so they assume it�s just a new drive in. Back at the pad, the robot Micky reports back to his masters by talking in his thumb/microphone as he mistakenly details a guitar Peter is playing to be a harmonic destructor and the phone that David answers to be a cat that he�s torturing. David and Peter notice that Micky is acting strange and it�s further confirmed when he mistakes their refrigerator to be a Zlotnick lady and starts chatting her up and they think he�s losing his mind. Later, the robot Micky, convinced they are spying on him, decides to blow them up with dynamite and the guys immediately restrain him. Having strapped him down, David and Peter do an inspection on him, discovering that his feet are backwards, realize that�s he�s from outer space. They head for the USO Headquarters where the kooky Captain distributes them protective helmets and at first mistakes Peter as a Martian (his hemlet�s on backwards). Then the Captain tries to convince them it�s all just a figment of their imagination but David and Peter mistake the Captain as another alien when they think they see his feet are backwards (never mind it�s only his shoes!) and end up tying him up before fleeing. Back at the pad, David and Peter try to interrogate the robot under a hot light and accidentally blow his mind. The robot holds out until Peter offers him some water and squirts him seltzer water which hits a nerve, accidentally causing the robot to freeze. Then David and Peter look in his eye and discover that it�s a robot sent to them for espionage purposes. They soon operate him and find the wire to his �truth tube,� and the robot Micky finally admits that the true Micky is in the spaceship where he�s being questioned before invasion. They ask him to take them to it so they all head for the beach where the spaceship is; once there, they are all beamed up inside where they find the real Micky with some head gear on him. When The Zlotnikans and the robot Micky threaten them with laser guns, everyone flees and soon and a wild chase set to �Star Collector� follows, wherein The Monkees and The Captain take on all on comers with lasers, seltzer water, and motorcycles, ending in The Zlotnikans passing out from dizziness. “The Monkees Watch Their Feet” (a.k.a. Micky And The Outer Space Creatures") is the first episode of The Monkees to credit Robert Rafelson and Bert Schneider as executive producers and Ward Sylvester as producer. It was also one of the last 2 episodes of The Monkees to contain a laugh track (the other was Episode No. 52, "The Devil And Peter Tork"). Goffin and King's “Star Collector” is used for a second time in a musical chase sequence, following Episode No. 42, "The Wild Monkees". A third will be No. 54, "The Monkees In Paris" (a.k.a. "The Paris Show"). Deleted from “The Monkees Watch Their Feet” was a hilarious segue wherein Peter squirts the invaders with the seltzer water, each time freezing them, but they wipe each other off and resume the chase; finally, they are stopped altogether when Peter squirts them all at once! Plus, The Captain was supposed to have gone into the duplicating machine and copied himseld four times over. Also, a 10,000 hour service was originally the reason for the robot Micky's declining The Monkees' invitation to stay with them on Earth, the real Micky and the robot Micky were dubbed "Micky #1" and "Micky #2," respectively, and the home planet for The Captain and his Assistant was originally going to be named the planet Spritz. The release of The Monkees' third album, The Monkees' Headquarters, occurred the day before the start of “The Monkees Watch Their Feet”'s filming. This was the eighth and final Monkees episode to be filmed on the shores of Malibu Beach, CA. The first CBS telecast (of just 2) of “The Monkees Watch Their Feet”, September 12, 1970, precipitated a second season of repeats of The Monkees TV show on The Eye Network's Saturday Afternoon schedule, and took place a full 4 years after The Monkees premiere on NBC. The U.S. flags seen in the wraparounds do not have the right number of stars on them. The small ones on Pat Paulsen's desk have 48 stars, whereas the big flag only has 35 stars. For the second time on the show 2 Mickys are featured; the first was Episode No. 25, “Alias Micky Dolenz”. This is The Monkees' first encounter with extraterrestrials; the second would be, of course, Episode No. 58, "Mijacogeo" (a.k.a. "The Frodis Caper"), The Monkees' series finale. The control panel used on the Zlotnickian ship here is also used in "Mijacogeo" as part of Wizard Glick (Rip Taylor)'s criminal arsenal. The teaser of this segment originaly opened with the camera zooming in on Michael, standing between 2 soldiers and clutching a microphone, announcing: "Ladies and gentlemen, this evening Raybert Productions and Screen Gems, with its usual lack of cooperation from the National Broadcasting Company, is pleased to present this special report from The Department of UFO Information." This part of the teaser was unceremoniously snipped for 1980s syndicated repeats; it has since been resurrected by Rhino for release on home video, and it now airs in syndication, too. Trivia Footnote: The line "National Broadcasting Company" was probably updated and redubbed as "Columbia Broadcasting System" for “The Monkees Watch Their Feet”'s retelecasts on The Eye Network's Saturday Afternoon schedule. “The Monkees Watch Their Feet” intersperses footage featuring the Monkee drummer from the following Monkees shows: Episode No. 12, "I've Got A Little Song Here", No. 32, "The Monkees On Tour", No. 33 "It's A Nice Place To Visit", No. 34, "The Picture Frame" (a.k.a. "The Bank Robbery"), No. 35, "Everywhere A Sheik, Sheik", No. 38, "I Was A 99-Lb. Weakling", and No. 42, "The Wild Monkees". During David and Peter's inspection of the robot Micky, the latter spouts nonsensical psychobabble: "Gort! Veringa!! Gort! Veringa!! Klaatu borada nikto! Klaatu borada nikto!" It recalls that old scifi horror favorite, The Day The Earth Stood Still (20th Century Fox, 1951). Also, the duplicate Micky says, "My name is Robby The Robot! ", referring to a central character from another scifi masterpiece, Forbidden Planet (MGM, 1956). A brief clip of the boys motorcycling around aboard the space ship in this segment can be seen in the main title sequence for The Monkees' second season. At one point, Peter Tork can be seen playing an impromptu acoustic rendition (on a guitar, not a bass!) of "Pink Shoe Laces," a Mickie Grant-composed tune which was a #3 hit for Dodie Stevens in 1959. Also, at the end of this episode, listen for Peter's brief, ad-libbed rendition of the 1931 Clifford Grey/Jack Waller/Joseph Tunbridge/Sonny Miller tune "Got A Date With An Angel", which became the inspiration for The Lovin' Spoonful's #2 hit from 1966, "Daydream" ("Gotta date with a blender..."). Plus, The Secretary (Pat Paulsen) can be heard briefly singing "The 59th Street Bridge Song (Feelin' Groovy)," a Simon and Garfunkel tune which was also a #13 hit for The Harper's Bizarre. Julia Ward Howe's 1861 Battle Hymn Of The Republic is adapted by The Monkees' background music composer-conductor Stu Phillips for use throughout almost the entire duration of “The Monkees Watch Their Feet” as its underscore. A snippet from an actual rendition of The Battle Hymn Of The Republic can be heard in Episode No. 3, “Monkee Versus Machine”, in the scene where Michael is introduced to J.B. Guggins, Jr. (Severn Darden); it also appears in No. 36, "Monkee Mayor," in the scene which finds Michael imitates Abraham Lincoln. In the scene where the robot Micky is frozen by a blast of seltzer water sprayed by Peter, he and David look inside robot Micky's eyes and see the wires and transistors of the radio which Micky (the real one!) previously dismantled and converted into a signal-relaying device in Cunningham Manor in Episode No. 2, “Monkee See, Monkee Die”. The small red pump which the robot Micky attempts to use to blast David and Peter to bits os the same one which the real Micky used in Episode No. 3, “Monkee Versus Machine”, to destroy a seemingly "indestructable" bird-baked-in-a-plastic-pie toy. The weapons that the aliens had were Astro-Ray guns from Ohio Art (the Etch-a-Sketch people). The guns were appear to be painted over the customary red and white colors, opting for white and grey. David and Peter change clothes in Act III of “The Monkees Watch Their Feet”; David can be seen wearing the same yellow shirt he wore in Episode No. 13, “One Man Shy” (a.k.a. "Peter And The Debutante"), and No. 15, “Too Many Girls” (a.k.a. "Davy And Fern"). And the episode's teaser sequence and Act II find Peter wearing the brown and tan T-shirt previously worn by Micky in No. 19, “Find The Monkees” (a.k.a. "The Audition"). Wardrobe Blooper: In the scene where the robot Micky guides David and Peter to the spot on the beach where they pop onto the ship (preceding the “Star Collector” chase sequence), David and Peter are wearing the clothing they previously did in Acts I and II. “The Monkees Watch Their Feet” (a.k.a. Micky And The Outer Space Creatures") aired in the week of writer Coslough Johnson's 39th birthday (Saturday, January 20, 1968). The late Pat Paulsen (The Secretary), as you may recall, was one of the unsung regulars on The Smothers Brothers Comedy Hour (CBS, 1967-69). Paulsen's presence in “The Monkees Watch Their Feet” reflects several other Monkees episodes which cross-promote TV shows from a rival network, like No. 23, “Captain Crocodile”, No. 45, "The Monkees In Texas", and No. 57, "The Monkees Blow Their Minds". Trivia Footnote: Pat Paulsen might have been running for president of the United States around this time. It is said that he cost Hubert Humphrey the election, since Richard Milhous Nixon won by less votes than Pat Paulson received. Love, American Style (ABC, 1969-74). Nita Talbot (The Assistant) took on parts in films as Girl Happy (MGM, 1965, as Sunny Daze), The Cool Ones (Warner-Bros., 1967, as Dee Dee) and Night Shift (Warner-Bros., 1982, as Vivian), as well as Rose Casey on the ill-fated 1979 NBC-TV drama Supertrain. Talbot also was known for her recurring role as the Russian spy Marya on Hogan's Heroes (CBS, 1965-71), which also featured Monkee guest Arlene Martel (“The Spy Who Came In From The Cool”, "The Monstrous Monkee Mash") as French spy Tiger.